Abu Dhabi to host International Travel Week (ITW Abu Dhabi). ITW Abu Dhabi is a co-location of synergistic tourism events each focused on the fastest growing global tourism market sectors such as Halal, medical, cruise, shopping and sports tourism. The Abu Dhabi Tourism & Culture Authority together with the Abu Dhabi Convention Bureau and Cacti Events, organiser of ITW Abu Dhabi, are bringing together hundreds of exhibitors featuring family friendly hotels and resorts, Halal travel operators and agencies, medical tourism facilitators, governments and healthcare providers, specialised sport tour operators, international and regional sport tourism destinations as well as international and regional cruise line operators, airlines and tourism boards. Thousands of regional and international visitors are anticipated to visit this important tourism event to learn about global and upcoming destinations. 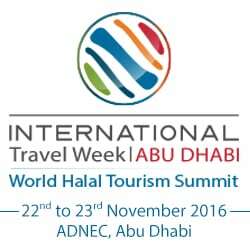 ITW Abu Dhabi will offer free to attend trade seminars and live theatres and attractions for the consumer audience. The event aims to provide an ideal platform for international and local businesses to showcase their products and services to trade professionals and consumers alike. Global travel spend is increasing year by year, Halal tourism already represents 12% of the global expenditure whilst the medical tourism market is worth 100 billion US$ with predicted annual growth of 30%. “Abu Dhabi Tourism & Culture Authority is delighted to be Host Destination Partner at the International Travel Week 2016 and look forward welcoming international delegations, investors, tourism associations and market-leading specialists to the event.” Said Mubarak Al Shamsi, Director Abu Dhabi Convention Bureau. “Palestine, the cradle of religions and civilizations, participates in the International Travel Week in Abu Dhabi. This event is of great importance to promote Palestine as a major destination for Halal tourism for the unique touristic and religious potential it has, especially in Jerusalem.” Stated His Excellency Dr. Rami Hamdallah, Prime Minister of the State of Palestine. Palestine is this year’s Country of Honour. As the demand by trade professionals and consumers in travel services and products grows, the International Travel Week Abu Dhabi aims to become an internationally recognised yearly exhibition and conference in the capital of the United Arab Emirates. International Travel Week Abu Dhabi combines a week of activities, a 2 days exhibition and conference alongside an entertainment programme for families, insightful seminars with experts sharing insider tips and industry expertise, tours, offsite meetings, first class networking opportunities and a glittering gala awards evening celebrating outstanding achievements in the international tourism industry. The event will have specific trade and consumer timings enabling participants to benefit from new business opportunities with both a trade and consumer audience.